AROUND 70 per cent of the communal rubbish bins on our streets are defective, according to a survey recently carried out by the MCHA. The scale of the defects is such that most bins are easily accessible to rats and gulls and the lack of containment for the rubbish produces an overpowering stench in hot weather. As a result of the survey several councillors have told the MCHA that they intend to ask searching questions about the state of the bins at the next environment committee meeting, which is on 7th October. If you have any stories about the state of your local bin do drop us an email and we will pass on your concern to interested councillors. 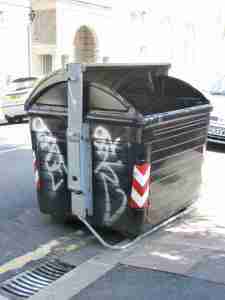 The survey covered the 50 bins in the MCHA area and was carried out over three days in late June. After a small scale trial of bins in 2004, Cityclean, the council’s rubbish department, replaced doorstep rubbish collections in 2009 with communal bins. The communal bin has gone through two redesigns. The first two designs were unsatisfactory and the latest promises to be no better. The original design of bin had a foot pedal. Seven of these pedal bins still survive, with the foot pedals in various stages of disintegration. None of the foot pedals work, although several of the bins still have large signs on them helpfully illustrating how the foot pedal might once have worked. These bins now have a handle to raise the lid instead of a foot pedal. The most common design of bin on our streets has a smallish lid with a handle that can be turned to open or close the lid to prevent animals getting into the bins and help keep down smells. There are 27 bins of this design. Only three had their lids closed during the survey. In 13 bins the lid was completely missing so it could not be closed. In the case of two bins it was not just the lid that was missing but the top cover, which includes the lid, making these bins no better than open middens. It is just possible that the odd case of a missing lid might have been the result of vandalism but in the overwhelming majority of cases this is fairly obviously normal wear and tear. The other lids were all open. Once the lid is open and swung back on its hinges it is out of reach for most people. But also the tops of many bins are badly dented, making it doubtful that many of these lids could be closed. The foot pedal design was a failure. So was the closable lid. The newest bins all have brushes in the opening where the previous design had a lid. Most of these bins are of recent origin and there are clusters of them in Western Road and Montpelier Road. It is too early to know if this design will be any more successful than the previous failures. However there are already signs that the brushes are becoming bent inwards after repeated use and on several of the bins they no longer provide an effective seal. On the bin in Temple Street one set of brushes has broken off. The other common defect—affecting around half of the bins in the survey—was various degrees of damage to the rubber on either side of the bins. In some cases it was missing and in other cases damaged so that it no longer provided an effective seal. The see-through bin in Powis Road was in a class of its own, with two triangular panels missing from the sides. MCHA members say it has been like this for several years and can be seen with its missing panels on the latest Google Streetview, which dates from July 2012. The survey also turned up a number of instances of flytipping. By chance on two days the survey was carried out immediately after the bins had been emptied so the results are almost certainly unrepresentative and understate the true scale of flytipping—which anyway tends to happen mostly after dark. There was also one bin, on the corner of Windlesham Avenue and Windlesham Road, which seems to have been in a traffic accident. It had a badly dented side as well as the more normal dented top—the result of damage caused by the lorry that empties the bin. On the day of our survey this particular bin had been replaced after emptying so that it obstructed the pavement. Fast forward five years and these claims clearly amount to no more than wishful thinking. Rubbish is now strewn around the communal bins. There has also been no discernible effect on the continued growth in the number of gulls. Our survey found that gulls regularly stake out suitable bins. In the past five years the gull population has soared as more and more gulls breed successfully, finding the essential nourishment for their chicks at the Cityclean takeaway. Cityclean also claimed that the bins were convenient. “There is a foot pedal at the bottom of the bin, this requires a light push with your foot to open the lid.” None of the foot pedals now work and the bins are on their third design. And the promise to clamp down on flytipping has proved to be worthless. Cityclean also rejected objections from many residents that the communal bins would lead to a reduction in the rate of recycling. Our survey found one bin that was full of cardboard. But a more reliable indicator of the impact of communal bins is to be found in Cityclean’s own recycling statistics. Cityclean publishes figures for recycling for the whole of Brighton and Hove. So the figures include suburbs where there have been no major changes to collections. In the year 2008/9—the year before the introduction of communal bins—recycling hit an all-time peak with 29.5 per cent of household waste being recycled, although this was still well below the national average. The rate of recycling across the city has been lower in every year since, falling to just 25 per cent in 2013/14. The national average is 43 per cent. Every year the MCHA makes its conservation awards to encourage people to maintain and restore their properties to a high standard. If the MCHA wields the carrot the council can brandish an impressive stick: it can—and sometimes does—force people to maintain their properties to a reasonable standard. The first step in this process is that the council will write to property owners asking them what they are doing to maintain their property. So we e-mailed Cityclean to ask what steps it is taking to maintain its property to a reasonable standard. What system, for example, is there for monitoring defects? What system is there for remedying defects promptly? What system is there for replacing bins that are past their use-by date? We emailed these questions to Cityclean towards the end of June. Six weeks later Cityclean has still not answered these questions.